Kimberley is a program manager at Duke Corporate Education where she works closely with clients, faculty members and colleagues to deliver innovative educational programs and blended learning solutions focused on getting leaders ready for what’s next. 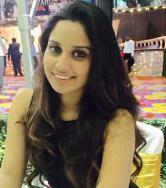 Kimberley hails from Goa and was born and raised in Ahmedabad. She began her career by taking a HR generalist role at a multi-national pharmaceutical company (Zydus Cadila) in Ahmedabad where she worked with the R&D plant. In this role she was responsible for a variety of initiatives including assisting with recruitment of junior scientists, employee engagement, training & development and other HR activities. The drive to continually learn motivated Kimberly to focus on the Learning & Development aspect of Human Resources, and she has a keen interest in this domain. Her formal education includes a degree in Business and a MBA with HR as specialization. Kimberley is an avid sportsperson (district level basketball player) and also a blogger who enjoys reading, writing and reflecting.